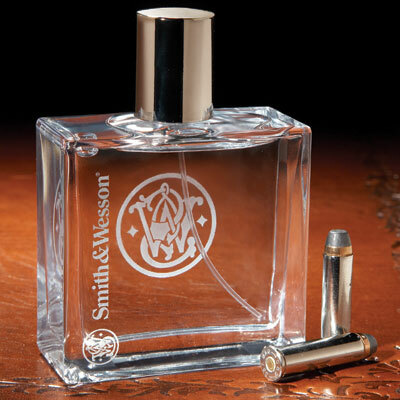 Undercover Black Man: Smith & Wesson makes a fragrance. This well-targeted product seems ready-made for Sarah Palin's "don't retreat, reload" yahoos. Their womenfolk can splash on some, too. I wish it were even a little bit funny, of course. so...., let's hear about what it smelled like? there's just no way in hell I can feature you seeing that bottle/brand and not taking a whiff. so...., let's hear about what it smelled like? ^ estiv, you're quick on the draw. I had the punch line chambered. But no, CNu... I had no impulse to check it out. But that does remind me of a vague childhood sense memory. My dad, who grew up in the country, had guns. Rifles mostly. And I remember the sweet chemical smell of a soft cloth associated with those long guns. I think that cloth was used to clean the barrels. And that's one of those smells I associate with Daddy... like sneaking sniffs of the Old Spice on his chest of drawers. Sarah Palin was just in town and her crowd smells of (that hair oil old white guys use) and cigarettes. dood, you couldn't keep me out of all-a-dat stuff. vitalis hair "tonic" with "V7" is mostly alcohol, no oil. i remember what that smells like. I was a big fan of cheap mens fragrances when I was a kid. I'm thinking brylcreem and tobacco may be what you smell on those old heads uncle John. Hi Karate, English Leather, and sundry Avon fragrances with collectible bottles rocked the highboy at my house, but daddy put straight up vaseline on his hair and then under a stocking cap so that it stayed "trained" and properly wavy - then a little of that stanky Jeris barber tonic on his neck or some Aftashave on his cheeks. Now my curiosity is piqued and I won't rest easy until I find out what Smith and Wesson smells like. You had to have squandered more than a little time here by now David. They have the single most exquisite utility fragrance known to man kind. LIMES DES BURAS—The invigorating heartiness of the pungent lime is captured in this scintillatingly positive fragrance. Actually, I was thinking Vitalis but it was really Brylcream. @ SeeNew - They sell the stuff at the local 24hr. Walgreens but I doubt they'll let you take a sample whiff. Big and Tall, in Metairie? Did you find your way to the store with the big, inflated, striped phallus on the roof? That makes the gun-scented cologne all the funnier. What next, Blackwater eau de toillette? Has anyone figure out the meaning of the sybolism on the Smith and Wesson bottle? i really would like to know. Has anyone figure out the meaning of the symbolism on the Smith and Wesson bottle? I make out an S and a W, with an extra curlicue or two.